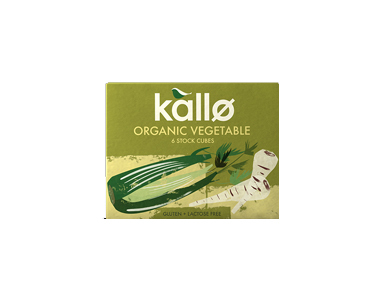 Buy Kallo Organic Vegetable Stock Cubes in the UK from our online shop or directly from our independent Scottish store. Stock cubes free from MSG, artificial colours and flavourings, gluten free and lactose free. Ideal for soups, stews and casseroles. Green soups can be nice too! British grown asparagus are only available for a very short time, so make the most of it while you can! This recipe contains 2 vegetable stock cubes. A seasonal recipe using seasonal vegetables like celeriac and onions. Simple and quick to make! This recipe contains 2 stock cubes. This tomato soup recipe is gluten free, vegetarian and vegan. This recipe contains 2 Kallo vegetable stock cubes. We sell real Kallo and other Stock & Bouillon directly from our shop in Scotland and online throughout the UK. Where can you buy real Vegetable Stock Cubes safely online? If you are wondering where you can buy Kallo Organic Vegetable Stock Cubes safely online in the UK, then shop with us. We are an actual health foods shop; with real people selling real foods and products. Our award-winning independent shop is located in Stirling, Scotland since 1976. You can buy our Stock & Bouillon in store or safely place an order with us online or over the phone. Vegetable Stock Cubes - Kallo Organic Vegetable Stock Cubes in Stock & Bouillon and Herbs, Spices & Salt.